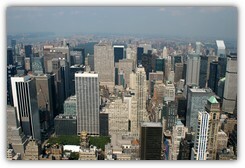 New York City holds a major place in global commerce, media, art, finance, education and entertainment. It is located on one of the world’s biggest natural harbors and consists of five boroughs that consolidated in 1898: Brooklyn, The Bronx, Manhattan, Staten Island, and Queens. Simply walking the city's streets will immerse tourists in many of the local traditions, customs and habits of the resident citizenry. Like other large metropolis', New York City never really has a down time. The city pulses with activity 24 hours per day, seven days per week. New York City has a population of over eight million, and it is the most culturally and linguistically diverse city in the world. More than 800 languages are spoken by the inhabitants of its 305 square miles. New York has much to offer in the way of culture and entertainment and a charter bus rental is the easiest way to take it all in! 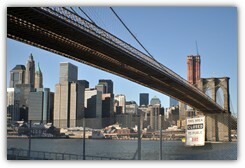 There are many sites to see during your charter bus travel in and around New York City. Charter bus rentals for group travel is perfect for corporate retreats and conferences, school field trips, team sporting events, or senior or social group outings. The Statue of Liberty is a must-see, although it might be hard to get to the top of the lady's torch. Sometimes it is closed off to visitors, and even if it is open, if someone cannot handle a lot of steep stairs, they might want to pass on trying to get to the top. She is a grand thing to look at, at any rate, so a trip to the park is a necessity. The Empire State Building is also something that most people will want to see while in the city. Located on the corner of 5th Avenue and 34th Street, it was the tallest building in the whole world when it was built in 1931 and held that title for more than 40 years, until the World Trade Center’s North Tower was completed. An excellent charter bus destination is the newly opened National September 11 Memorial. It is located on the exact spot where the Twin Towers were destroyed on September 11, 2001. Since its dedication on the 10th anniversary of the incident, the memorial has seen over one million visitors. While New York City, many visitors will want to go to see a Broadway show. There is nothing quite like it. To accomplish this, a charter bus trip to the famed Times Square will be in order. The traveler would be well-advised to buy show tickets in advance, if at all possible, since some shows sell out very quickly. New York City is part of the Northeast and Atlantic coast transportation corridors. Partly because of its geographic proximity to other cities and partly because of its large, concentrated population, numerous charter bus routes are available to the frequent charter bus group travelers. Charter bus travel routes are broken into a couple of different categories: intrastate, interstate, and international. All categories serve dozens of regular routes and make charter bus rentals an easy option for group events in New York City. Common, intrastate transportation is available to Rochester, New York, The Hamptons in Long Island, and Buffalo, to name a few. 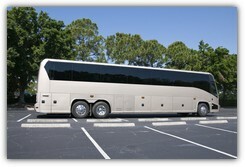 These charter bus departures tend to cluster toward the beginning and end of the week, to accommodate weekend getaways. Interstate, charter bus travel is available throughout the weekend. Cities served range from Boston, to Washington D.C., and as far south as Miami, Florida. Generally, the further the distance traveled, the less frequently charter bus services will run. Because of New York's close proximity to Canada, many charter bus rentals are available that cross country lines. When requesting an international charter bus rental quote, make sure that all the appropriate entry and exit VISA requirements are met for both Canada and the United States. Otherwise, unsuspecting tourists can find themselves stranded on either side of the border. When their stay in New York is done, visitors should be sure to check out one of the many other great cities that are within a few hours' drive (or less): Newark, New Jersey; Philadelphia, Pennsylvania; Baltimore, Maryland; Boston, Massachusetts; and Washington, DC. This will definitely be a trip to remember! The Hamptons is a series of towns located on the northern end of Long Island. Many New Yorkers head out to the Hamptons for extended weekends. Unlike the perpetually stimulating Big Apple, the Hamptons take on a slower, milder temperament. Coney Island lies on the southern tip of Brooklyn, New York. The name "Coney" was an English adaptation of a Dutch word that meant "rabbit", owing to the large numbers of rabbits that existed at the time. Today, the area's name is synonymous with amusement parks. Coney Island is in the early stages of a dramatic restoration and evolution. Several large developers have stepped in to transform the area and catapult it into 21st century modernity. Brighton Beach is near Coney Island. Over the last thirty years, the area has become a major gateway to America for emigrating Russians and other former Soviet bloc countries. Brighton beach serves as an inexpensive way to experience authentic, Russian culture, without having to make the thousands of miles flight across the Atlantic Ocean. After (or perhaps before) the show, city visitors will want to visit one of New York's more than 12,000 restaurants. But how can one decide which ones to choose? Those in the mood for French food can consider either L'Atelier de Joel Robuchon at the Four Seasons Hotel on East 57th Street, or Per Se at the Time Warner Center on Columbus Circle. 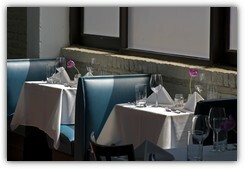 Dinner for two at either of these restaurants will cost well over two hundred dollars. Love sushi? Check out Masaat the Time Warner Center. Masayoshi Takayama is a food genius though genius comes at a price. Dinner for two at this restaurant will cost over $800. Craft on East 19th Street offers a great choice of vegan fare for a relatively reasonable price - $150 for a dinner for two. For a truly classic dinner, head down to Delmonico’s on Beaver Street. This NYC institution has been serving up steaks for hungry consumers since 1837. Dinner for two here will run between $100 and $200. The beefy price tag is well worth it, for the slice of history that comes served up with the meal. Finally, all visitors should take the opportunity to head over the Brooklyn Bridge into Brooklyn and eat at the Peter Luger Steakhouse. In business since 1887, there is nothing quite like it anywhere. What makes it so special? For one, the owners and the owner's family members are only allowed to select, which meat carcasses to purchase. In addition to their own proprietary technique, they only select USDA Prime meat, representing less than 2% of all beef available on the market. They then dry age each purchase for 21 days in their own dry aging facility. The results are steaks, filets, and roasts that are second to none in flavor, texture, and enjoyment. The restaurant has become so famous that they now ship their uncooked meats to customers around the world. 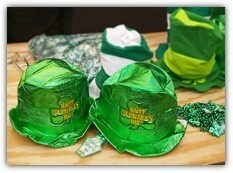 New York City hosts America's largest St. Patrick's Day festival. Over a million people turn out to see over 150,000 marchers participate. The event is held on either March 16th or the 17th, depending on the day of the week the actual holiday falls that year. The actual parade is only five hours in duration. However, that does not stop most residents and tourists from starting to celebrate days in advance. During summer months, be sure to catch a baseball game at the famous Yankee Stadium. The stadium, known as the "House That Ruth Built", is a veritable shrine for baseball enthusiasts. Time's Square New Year’s Eve event is one of the world's largest parties, which celebrates the turning of the page to a New Year. Tens of millions of visitors watch on TV as over a million party-goers pack Times Square, counting down the last remaining seconds, before the New Year arrives. If you were searching for charter bus rentals that serve New York City to from and around the state of New York, you've come to the right place!